At 49 Degrees North, there's something for the entire family. The resort also offers pristine groomers, perfectly gladed tree skiing runs (lots of them) and a friendly base area lodge, complete with lunch-tray-sized nachos and a full array of adult libations in the Boomtown Bar. The ski area is one of the largest in the state of Washington, with 2,325 acres of skiable, lift-served, patrolled terrain over Chewelah Peak and Angel Peak. Located in Oregon's northeastern corner near the town of La Grande, Anthony Lakes receives an average of 300 inches of light, dry, powdery snow known to blanket the area during the winter months. The ski area operates more than 1,100 acres with three lifts. In addition to downhill skiing and boarding terrain, the resort has 30 km of groomed, track-set Nordic trails that vary in difficulty. Finish off your day warming up by the fireplace in the base-area lodge. Apex has the recipe for epic conditions. Combine an average winter temperature of 23 degrees Fahrenheit, annual snowfall of 20 feet and a prime location in the heart of Okanogan Valley with 1,112 acres of groomers and steep chutes and top it with champagne powder, and it's no wonder why Apex is one of the greatest hidden gems in Canadian skiing. Aptly named Big Sky Resort is the biggest skiing in North America, with 5,800 acres of skiable terrain over four connected mountains. Big Sky also boasts big snowfall, with an average of 400 inches annually. With an average daytime winter temperature of 25°, you're sure to experience the epitome of Montana snow: Cold Smoke. 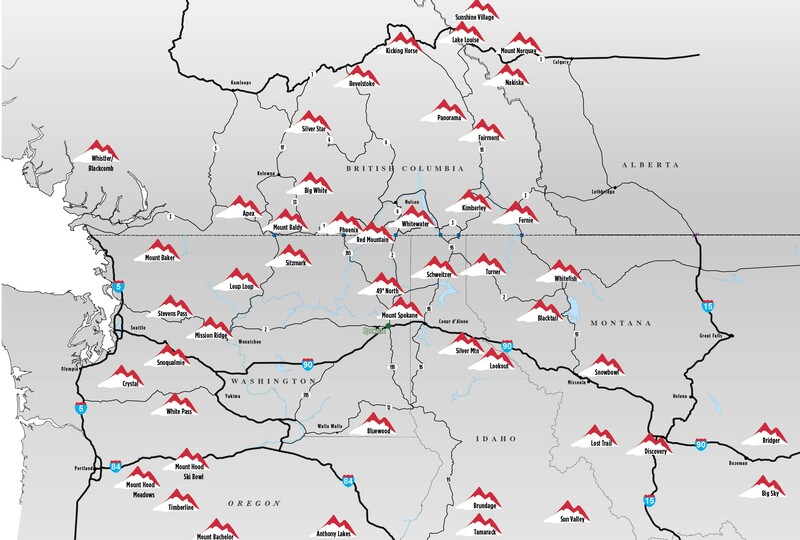 Big Sky is all about amenities, with 23 chairlifts, 11 surface lifts and seven terrain parks. The village is well equipped, with numerous lodging, dining and retail options. Adding to Big White's already full assortment of village amenities, new for this season is the Black Forest Day Lodge, scheduled to open in December. On the slopes, skiers and snowboarders will find 900 acres of groomed runs and 1,500 acres of glades, with a total of 2,765 acres of skiable terrain to explore. Big White offers the most night skiing terrain in western Canada, with 38 acres. The resort also offers plenty of activities for kids of all ages back in the village, including snowmobiling, ice climbing, horse-drawn sleigh tours and ice skating, to name a few. Perched above the town of Lakeside on the western shores of beautiful Flathead Lake, Blacktail offers that quaint Montana vibe in a unique setting. Skiers and snowboarders will experience a top-to-bottom run of varied terrain before ever riding the chairlift, as this mountain is upside down, with the base area village at the top of the mountain. The mountaintop village offers a couple of dining options and expansive views of Glacier National Park in the distance. Located 20 minutes from the vibrant college and mountain town of Bozeman down Bridger Canyon, Bridger Bowl boasts a friendly local vibe with a big-mountain skiing experience. The mountain's layout is a large, V-shaped funnel, making it very user-friendly. It's approximately two miles wide on the ridge-lined summit, while near the base, it's only about 200 yards across. As the mountain rises, so does the skill level, making the progression process obvious — the higher you go on a chairlift, the more difficult the terrain. Located only 8 miles from the charming mountain and lake town of McCall, Brundage Mountain boasts the "Best Snow in Idaho" with an average of 320 inches of annual snowfall. The resort itself offers 1,500 acres of skiable terrain, and another 19,000 acres through their backcountry snowcat operation. There are plenty of food and beverage options on the mountain. Utilize the Brundage Express Shuttle, with daily routes to and from McCall, to make the most of your holiday in the hills of central Idaho. Conveniently located southeast of Seattle in the foothills of Mt. Rainier, Crystal Mountain feels a million miles away from the hustle and bustle of the city. The resort offers plenty of terrain — of 2,600 total acres, 2,300 are lift-served – in the northeast corner of Mt. Rainier National Park. There's a little bit of everything: groomers, steeps, bumps, glades and chutes, and sweeping views of the region's volcanoes. There are many on-mountain dining facilities, as well as multiple options in the village area. For the full mountain experience, take advantage of one of several lodging options. The three faces of Discovery Ski Area blend a perfect balance of gently sloping runs, more advanced groomers, steep mogul skiing and terrain similar to what's found in Alaska, without having to take a helicopter to get there. "Disco" is located off the beaten path, near the towns of Anaconda, Georgetown and Phillipsburg. The summit elevation is 8,158 feet, so the average annual snowfall of 215 inches comes in the form of light, fluffy powder. With 2,200 acres, there's plenty of terrain to discover at Discovery. What pairs with a long day on the slopes for the entire family? Soaking in hot springs in a world-class setting. Fairmont, located in southeastern British Columbia, offers options for the entire family looking for an active vacation. Downhill and Nordic skiing, snowshoeing, tubing and multiple lodging options are offered. Every lift ticket comes with access to the oversized hot springs. Consistently voted one of the best ski towns around, Fernie Alpine Resort backs it up with 2,500 acres of skiable terrain, five alpine bowls that offer a little something different for everyone, 37-plus feet of annual snowfall and one of the coolest little mountain towns near the village. In addition to skiing and boarding, Fernie offers up many activities like snowshoe fondue tours and Nordic skiing, as well as many in-town activities, including art openings and live music. What do you get when you mix perfect Purcell powder, an infinite amount of sunshine and a Bavarian-themed town? Kimberley Alpine Resort. Located in the Purcell Range in the Canadian Rockies, the resort offers breathtaking views and a laid-back, relaxed atmosphere. There are 1,800 acres of varying terrain, from wide-open immaculate groomers on the front side to challenging bumps and glades on the backside. Lake Louise Ski Resort boasts everything you need for your next Canadian ski adventure, with endless chutes, glades and gullies, gentle slopes, cruising runs and remote bowls over a massive 4,200 skiable acres in the heart of scenic and historic Banff National Park. 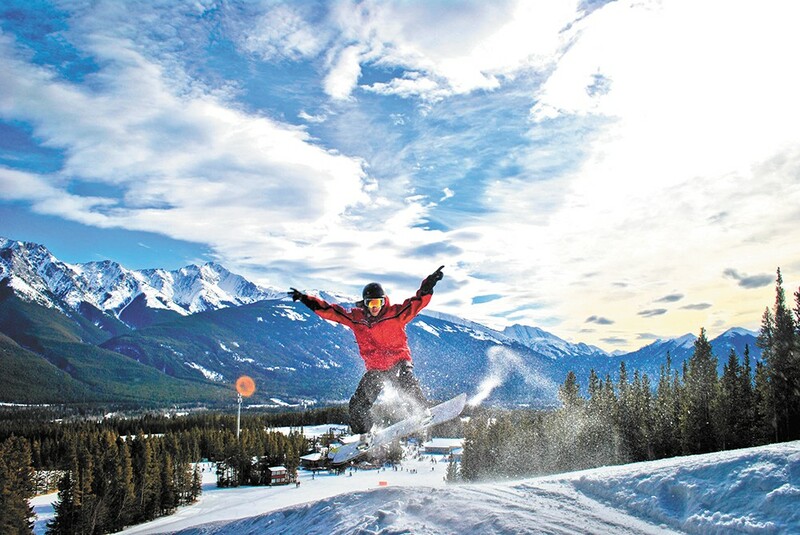 In addition to the vast amount of terrain for skiing and snowboarding, Lake Louise offers many other activities to engage in while off your skis. Lookout Pass is a genuine, family-friendly atmosphere with world-class grooming and untouched powder. Lookout receives an average of 400 inches of annual snowfall, the region's lightest and driest. Conveniently located off Interstate 90 on the Idaho-Montana border at the crest of the Bitterroot Range, Lookout's terrain is mostly north- and northeast-facing, keeping the snow in pristine condition. At the base, you'll find the Northwest's second-oldest ski lodge. When you visit Lost Trail Powder Mountain, you'll certainly enjoy the beauty and uncrowded slopes of the Rocky Mountains' hidden jewel. Located about 90 miles south of Missoula at the junction of Highways 93 and 43 — at the top of the Continental Divide in the Bitterroot Mountains — Lost Trail boasts 1,800 skiable acres over two mountains. Expect to be surprised by the unbelievable powder, the low prices and the great vibe of this locals-only type of mountain. Loup Loup Ski Bowl is located in the beautiful north-central Cascade Mountains, off scenic Highway 20. The area is operated by a nonprofit foundation, with the mission of "Promoting lifelong passion for outdoor winter recreation through education for the surrounding community." The ski area offers about 300 acres of skiable terrain for downhill adventure, and another 23 km of Nordic trails to explore. Located on the sunny side of the Cascade Mountains near Wenatchee, Mission Ridge offers terrain for the entire family — whether cruising wide-open groomers past one of the many enormous rock features scattered throughout the mountain or dropping into one of the many secret narrow chutes, there are over 2,000 skiable acres to explore. The resort also boasts light powder, tons of sun and amazing views, with plenty of lodging and dining options located 12 miles down the road in Wenatchee. Located on the eastern flanks of Oregon's Central Cascades near the quintessential mountain town of Bend, Mount Bachelor is known for its light, dry snow, diverse terrain, family-friendliness and long seasons. The mountain also boasts 3,700 acres of lift-accessible terrain and a summit that guests can ski or ride off of in all directions. It's the highest skiable elevation in all of Oregon and Washington. Mt. Baker Ski Area is located in the Mt. Baker-Snoqualmie National Forest in the shadows of one of the Northwest's many active volcanoes, the ski area's namesake. Skiers and snowboarders flock to Baker, as the mountain's average annual snowfall is 700 inches. Mount Baker is not for the faint of heart — more for adventure seekers with the desire to experience some of the most amazing conditions and the steepest and craggiest terrain in the Northwest. Located in sunny southern British Columbia and overlooking the Okanagan Valley, Mount Baldy offers plenty of sunshine, tree skiing and untracked powder, with an average of 250 inches of light, dry snow over 500 skiable acres. Combine your skiing adventure with a visit to one of the area's many wineries for a unique skiing experience. Mount Hood Meadows offers a big-mountain experience and some of the Northwest's most diverse and playful terrain. Located on the sunny, wind-protected side of Oregon's most iconic mountain, it receives an average of 430 inches of annual snowfall that blankets 2,150 acres of skiable terrain. The mountain also offers a large amount of terrain for night skiing adventures. Mount Hood Skibowl offers up many options for the adventuring family's time on the mountain. In addition to a full menu of options for skiing and snowboarding, including a massive amount of night skiing terrain – one of the country's largest operations — Skibowl offers an Adventure Park just for kids. Activities include day and night-time Cosmic Tubing and Frosty's Playland. There are several dining options at the ski resort, with many lodging options available nearby. Located above scenic Banff National Park, Mount Norquay offers a unique Canadian skiing adventure in a quaint atmosphere. The mountain features 190 skiable acres, with the summit reaching an elevation of 8,040 feet. Daily bus service is available from Banff, only 4 miles away. Conveniently located 28 miles from downtown Spokane, in the heart of Washington's largest state park, Mt. Spokane Ski and Snowboard Park offers 1,425 acres of skiable terrain over 45 runs, consisting of heart-pounding glades and fast groomers. The mountain also offers the most acreage of night skiing terrain and hours in the Inland Northwest, with 16 night skiing runs open Wednesday through Saturday evenings until 9:30 pm. The closest ski area to the bustling metropolis of Calgary, only 45 miles away, Nakiska was the home to the Alpine events for the 1988 Winter Olympics. The ski area offers 1,021 acres of skiable acres and boasts immaculate, wide-open groomers. In addition to on-mountain amenities, you'll find world-class dining, accommodations and spas nearby in the Kananaskis Village. Boasting one of North America's top verticals, Panorama offers the perfect Canadian getaway for the thrill-seeking family. With 2,847 acres of skiable terrain, ranging from wide-open groomers to powder-filled trees and steeps, 75 percent of the terrain is suitable for beginners and intermediates, although challenge awaits those adventurous enough to head in to Taynton Bowl with 700 acres of black-diamond runs. Finish your big day on the mountain, enjoying the world-class hot pools back in the village area. Nestled in the mountains between Greenwood and Grand Forks, Phoenix Mountain is a charming destination for those skiers and snowboarders looking for an adventure. The mountain offers a "locals only" feel, with plenty of fresh powder and expansive views of the southern Monashee Mountains. There are 18 runs, all accessible by the T-bar, which provides terrain for skill levels ranging from beginner to advanced. The unique community atmosphere is always welcoming and has been deemed "The Best Little Mountain in B.C." With a quick trip across the U.S.-Canadian border, you'll discover a great, unspoiled resort. Just outside the town of Rossland and right over the border, Red Mountain delivers 4,200 acres of pristine skiing over four peaks, an epic amount of vertical, inbounds cat skiing on some of its newly expanded terrain, and lots of steeps with deep snow — an average of 300 inches falls annually. Lodging is available right in the village, with many off-mountain activities to enjoy in the community, rounding out the perfect Canadian ski adventure. The title for the biggest vertical in North America goes to Revelstoke Mountain Resort, located on Mt. Mackenzie in B.C's Selkirk Mountains. In addition to the huge amount of vertical, the resort also offers 3,121 acres of fall-line skiing, high alpine bowls, renowned gladed terrain and endless groomers, as well as activities for the entire family in the Turtle Creek Tube Park. Revelstoke also has a beginner area, featuring skiing all day and night, right in the center of the village. It's the only resort to offer cat-skiing, heli-skiing and lift-assisted skiing from one base area. Looking for destination amenities without the crowds that usually go along with them? Discover Schweitzer Mountain Resort, located above the beautiful town of Sandpoint, with sweeping views of Lake Pend Oreille below. Schweitzer offers 2,900 acres of lift-served terrain, ranking it as one of the largest resorts in North America. The terrain includes incredible bowls, chutes, groomers and more than 1,200 acres of tree skiing. Back in the village, you'll find plenty of lodging, dining options and après-ski activities. Located right off Interstate 90 in Kellogg, it's all about ease at Silver Mountain Resort. Once you arrive into the Gondola Village, jump on the scenic, 3-mile long gondola with your morning coffee and get whisked to the top to start your day of exploration. The resort, spread over two mountain peaks, offers a nice variety of terrain, with glades and groomers and more than 1,600 acres of skiable terrain. After you've made your way back down to the Gondola Village, it's time to explore the Silver Rapids Waterpark, Idaho's largest indoor waterpark. Silver Star is home to champagne powder and 3,282 acres of varied terrain for all abilities and adventure levels. 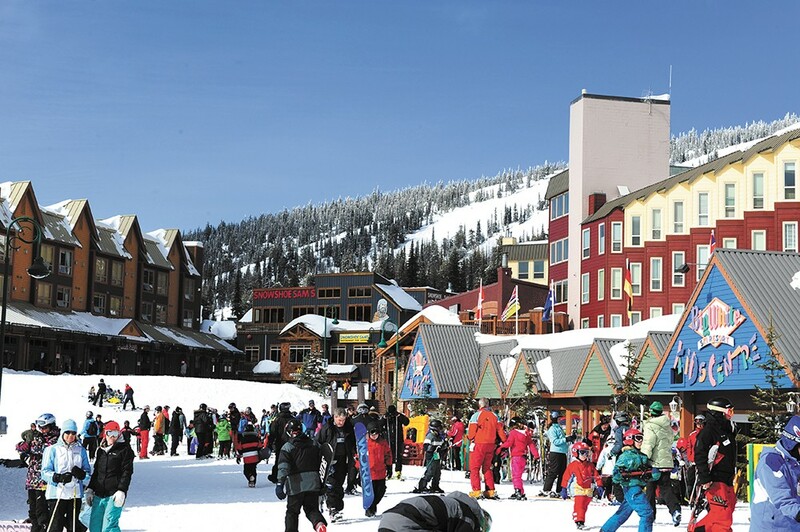 B.C's third-largest ski area is home to a colorful mid-mountain village offering true ski-in, ski-out access to the slopes. There are four distinct mountain faces and a progressive terrain park perfect for learning. Those seeking adventure should head to the backside, where 1,900 acres of steep, black and double-black diamond terrain awaits. Located in the North Cascades, 20 minutes northeast of Tonasket, Sitzmark Ski Area offers dry, powder snow, lots of sunshine, great views, small lift lines and low ticket prices, with 80 acres to explore. Back in the village, Sitzmark offers Wi-Fi and a friendly lodge. Bluewood is located 54 miles northeast of Walla Walla in the Blue Mountain Range of southeast Washington. The mountains rise out of the high desert, providing clear skies and cold temperatures, resulting in light, dry powder. The mountain boasts the second-highest base elevation in the state at 4,450 feet, giving it the reputation of the best snow in Washington — an average of 300 inches of snowfall — with some of the most memorable tree skiing offered in the region. Snoqualmie Pass, located 54 miles east of Seattle on Interstate 90, consists of four unique areas totaling 1,981 acres of skiable terrain, all offering something a little different for skiers and boarders looking for easy and quick access to the mountains. In addition to amazing terrain parks at Summit Central, the steeps of Alpental and extensive night skiing at Summit West, the Pass also offers Nordic skiing and snow-tubing adventures. Located in the Lolo National Forest, only 12 miles above the vibrant town of Missoula, Snowbowl offers an exciting mix of steep terrain, glades and wide-open cruisers. In addition to being known for having some of the most challenging terrain around, Snowbowl is also renowned for terrific food and beverage offerings, with a great base-area atmosphere. Stay slopeside at Gelandesprung, a European-style lodge, or chose to stay in Missoula, with a wide array of lodging and dining options available in the earthy college town. Stevens Pass is located on the crest of the Cascade Range in two national forests, the Mt. Baker-Snoqualmie National Forest on the west side of the crest and the Wenatchee National Forest on the east side. There are 1,125 acres of skiable terrain to explore over the 37 major runs and countless bowls, glades and faces. Getting to Stevens is easy from either side — it's 90 miles from Seattle and 35 miles from the quaint, Bavarian-themed town of Leavenworth on scenic and well-maintained Highway 2. You'll find epic conditions at Stevens, with an average annual snowfall of 460 inches and an average snowpack of 105 inches. Night skiing is available five nights a week, Wednesday through Sunday, with up to six lifts lit up for night operations. Sun Valley consists of two very distinct areas, split by the lively town of Ketchum. At Baldy, you'll find perfect-pitched vertical from the peak to the base. There are no flats; it's all vertical. The lift infrastructure ensures minimal lift lines, and the terrain ranges from expert to beginner, with immaculate groomed and open bowls. Dollar Mountain, the learning ski hill for the area, is home to the very first chairlift. In addition, Dollar includes rails, a super pipe and a terrain-based learning environment. Sunshine Village sits high on the Continental Divide in the heart of Banff National Park. A quick 15-minute drive from the historic mountain town of Banff, it boasts three sprawling mountains. The resort features 3,300 acres of skiable terrain, and you can even ski two provinces — British Columbia and Alberta — in one run. Because of the large amount of average snowfall (approximately 360 inches), the village's high altitude (7,082 feet) and the cold temperatures, Sunshine's operating season stretches from early November through late May, the longest non-glacial season in Canada. Located in the heart of Idaho's beautiful west-central mountains and overlooking Lake Cascade, Tamarack Resort features a blend of mountain, meadow and lakeside amenities. With 1,000 acres of lift-accessible and diverse terrain ranging from groomers and glades to cornices and steeps, the mountain is east-facing, offering minimum wind and maximum snow retention. The village's multiple lodging and dining options make Tamarack a perfect family adventure. Located only 60 miles from Portland, atop the south side of iconic Mt. Hood, sits the historic Timberline Lodge, the base area for Timberline. The ski area offers 1,415 acres of skiable terrain and is the only resort in North America that operates 12 months a year, snow permitting. Lodging is available at the Lodge or just 6 miles away in Government Camp. A must for those looking to explore the mountains of western Montana is Turner, located in the Kootenai National Forest above the town of Libby. The area boasts a true top-to-bottom, 2,100 vertical feet with some of the best fall-line skiing in the Northwest. The mountain is user friendly; there's one chairlift, and all runs lead back to the base area. This is the quintessential "mom and pop" operation in Montana; when it's closed, Turner even rents out the mountain for private functions. Ranked as the #1 Overall Resort by Ski magazine, Whistler and Blackcomb are two side-by-side mountains; when combined, they make for one huge skiing adventure. Included in the 8,171 acres of terrain are 16 alpine bowls, 200 marked runs and three glaciers to explore. This world-class ski area doesn't just stop at the skiing — when you add more than 200 retail shops, restaurants, endless nightlife and a full range of activities for the entire family, a trip to Whistler/Blackcomb will satiate your thirst for adventure. Located in the shadows of Mt. Adams with majestic views of Mt. Rainier, White Pass provides terrain for skiers and boarders of all abilities. Located on Highway 12, about an hour west of Yakima, White Pass offers a perfect escape from the city in a relaxed, family-friendly atmosphere. The area features slopeside lodging and amenities you'd expect to find at larger resorts. In addition to a range of skiing and boarding terrain ranging from rolling groomers to challenging glades, there are 18 km of track-set Nordic trails available to explore. Located above the cute mountain town of Whitefish on Big Mountain, Whitefish Mountain Resort offers the perfect ski and snowboard adventure in a picturesque setting. There are 3,000 acres to discover, whether ripping down fast groomers, exploring endless glades or taking in the view in the newly renovated Summit House lodge, now offering a true 360-degree view of the surrounding vistas, including Whitefish Lake and Glacier National Park. In the village, there are plenty of lodging options to rest your tired legs at the end of your day, or stay in town to explore Whitefish's vibrant nightlife.